Oxfam Germany has calculated how long the individual participants of the Lidl supply chain have to work to earn 4500 euros. 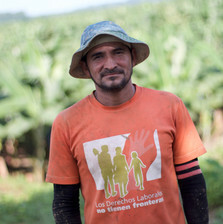 For a worker on a plantation in Ecuador, let us call him Miguel, it takes a year. For an employee of the Lidl chain it takes less than 8 weeks. Sven Seidel, the director of Lidl, makes this amount in 5.5 hours and Dieter Schwarz, founder and owner of Lidl, in just 68 seconds. Due to the highly complex structure of Lidl, their actual profit can only be guessed at. Oxfam Germany estimates their profit to be around 3.5 billion euros in the financial year of 2014 - 2015. Not only plantation workers, but also, for example, cashiers in the European supermarkets often don't get a decent wage for their work. On the other side of the supply chain, however, between fruit companies and retailers, there is more than enough prosperity. We think it's very important to talk about the inequality that is deeper and deeper in today's world. According to Credit Suisse, 10% of the richest people of the planet own 89% of the world's wealth. Our counter is just an illustration of a very complex problem we should give more attention to. Bananas are the bestselling fruit in the world. They don't need advertising, everybody wants them. As cheap as possible. Healthy snack that you do not have to pack. Toxic chemicals, lifeless landscape, miserable salaries, health-destroying work. The banana story also has its dark side. Let's unpeel it with us! Bananas need people to grow, harvest or box up. How is the life on a plantation? "We have to work miracles with the minimum wage, to figure out how to make ends meet with it." Meeting with the employees of this plantation that supplies fruit to a multinational company Fyffes took place in the dark, with only candles and light from mobile phones, because of a severe storm that had caused a power outage in one-half of Costa Rica. But we could not show you faces of the people we spoke to anyway. They are not just afraid of getting fired, they fear for their lives. "Plantation manager tells us: "When the plane flies, take shelter!" But there is nowhere to hide on the plantation." He was joking with us all the time, but he became serious when he had described us what he thinks of his employer, the Chiquita company. According to him, this company does not export the fruit, it exports the very blood of its employees. The company reduces the amount of workers on the plantation to save money – but those who remain must consequently do much more work. For the same pay, of course. "We are trying to negotiate better conditions with the management, but no one from the company wants to meet us." "What is happening in Costa Rica is very cruel. Extremely hazardous chemicals are not handled as they should be, and therefore they pollute the water and kill the fish and other animals. "Even if you get a headache from the chemicals, you have to keep working. According to them, you are just making it up." Andrea was smiling throughout our conversation, even though she was saying horrible things about her job. When she entered the union, her partner got sacked from the same plantation because of that. And during her pregnancy, she has been working with dangerous chemicals for several days because she was scared of getting fired if she refuses to do that. "Everyone here is scared, and so out of the whole plantation I am the only one in the union." Monoculture and toxic pesticides threaten the environment. The vast majority of bananas destined for export are grown on large-scale monoculture plantations which grow nothing but bananas. Really, it is not very lively around here! Only a small percentage of bananas are grown on smaller farms and not in a monoculture, but the production of small growers is a lot more environment friendly. 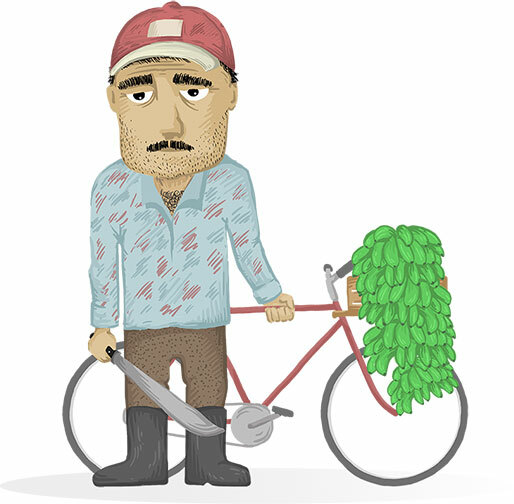 Meet Elias Guerrero, a farmer from Ecuador's Fair Trade cooperative UROCAL. Banana tree is the largest herb in the world and its stem actually consists of twisted leaves. Bananas are harvested throughout the year, while they are still green - they ripen in ripening depots at their final destination. When treated with good care, a banana tree continues to yield easily for up to a quarter of century. The most common banana export variety is called Cavendish. It has great advantages: it does not contain inedible seeds, each fruit is roughly the same size, and it is able to survive the long transport unscathed thanks to its thick peeling. Disadvantages? Cavendish is propagated by cuttings and each plant is thus actually a clone. Therefore it does not have such a strong genetic makeup and is easily damaged by pests and diseases. Many bananas never leave the country they grew up in. They either have some dent or stain, or they are too long, short or wide. The rules are firm in the banana trade. 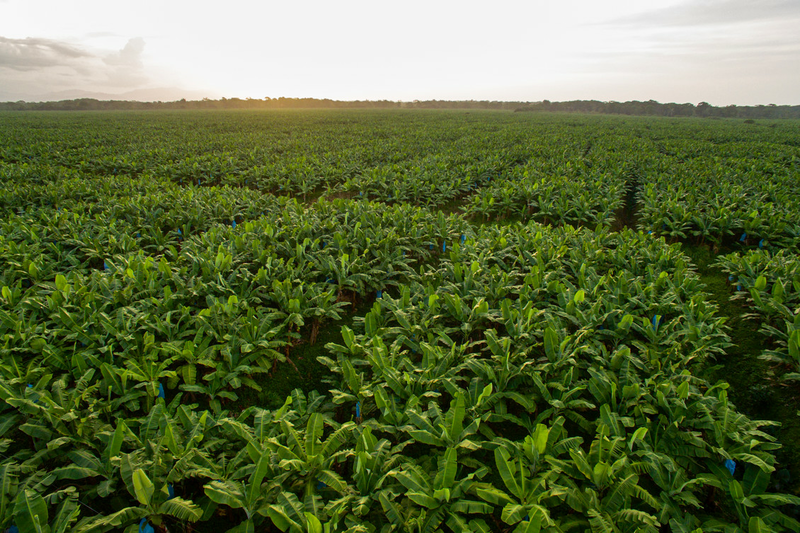 In the endless rows of banana trees, diseases and pests have no natural enemies and they spread very quickly. The genetically fragile Cavendish needs to be carefully protected. For example against the tiny worms that can disrupt the root of the plant so much that it withers away completely. You can see the difference between the healthy root and the withered one in the photo. Or against a disease whose name resembles a name of some poisonous spider - Black Sigatoka. It causes wilting and its spread leads to a much smaller harvest. This is why the protection of banana trees requires large amounts of pesticides - substances made to eradicate various kinds of living organisms. Herbicides, fungicides, nematicides or insecticides are very efficient in killing. They are applied either manually or by aerial spraying by plane or helicopter. Yet they do not always kill what they are supposed to. Pesticides are another reason why the plantation is not very lively: they are lethal to small animals and birds. Birth defects frequently occur in the vicinity of the plantations due to the presence of toxic pesticides - this dog is missing a piece of it's paw since birth. Due to the frequent rains, the hazardous substances get into waterways and destroy all the life there. In many areas, local residents do not have access to clean and safe water, which endangers their health. Pesticides are hazardous to the environment and to the people who work on plantations or live in the area. However, the banana trade could hardly exist without the chemistry nowadays. Bananas are the second most chemically intensive crop grown after cotton. What do the pesticides cause? 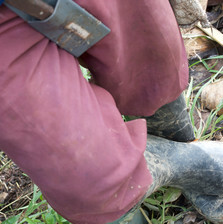 Toxic substances used on plantations are extremely dangerous to human health. But one can save money on protective equipment for the employees, so the companies do. Headaches and dizziness or fainting. Blurred vision and burning eyes. Irregular heartbeat, but also serious mental disorders such as schizophrenia or depression (long-term consequence of intoxication). Cancer - mostly testicular cancer in men and cervical cancer in women. Reproduction disorders, bleeding or miscarriages in women, severe disabilities in newborns. Contamination of food and water by toxic substances is a huge problem in some communities near the plantations. Work on the plantation is hard and dangerous, but you won't get much money for it. Bananas are the means of livelihoods for millions of people worldwide. For some, it is a major part of their diet, for others an essential or even the only source income in the family. In many areas the wages of workers in the banana industry still do not cover the basic living needs. Yet they do very demanding work with long hours in a hot and humid environment and with heavy loads. Banana prices in the stores stagnate as do the wages of those who grow and harvest the bananas. The retail price of bananas remains the same as it was in the 2001 in all the EU countries (with the exception of the UK). In the case of most of the major exporting countries the wholesale and import prices are falling, and along with them does the amount intended to cover the production costs. In most of the producer countries the prices of inputs and basic necessities of life are constantly increasing. The gap between what people get for their work or product and what they need for the survival of their family is wider and wider. Between the 2001 and 2015, the cost of transporting bananas by sea has risen on average by 233%. Pictured is a Costa Rican port of Puerto Limón. Prices of fertilizers and pesticides has increased by 195%, the cost of packaging materials has increased by 150%. Prices of basic necessities of life (food, health care, education, housing, transport, communication) in Colombia have increased by 92%, in Ecuador by 129%, by 218% in Costa Rica, and by 278% in the Dominican Republic. People from plantations often face Sophie's choice - pay for food, school, rent, or a doctor? They can't afford all of that. Everyone has to look for new ways to save money. Companies reduce staff numbers and increase the amount of work for the remaining employees. They use employment agencies who pay lower wages to third party workers. They do not pay bonuses for working on weekends or public holidays, and they abuse the vulnerable situation of migrant workers. Protective equipment is worn right up until it completely falls apart. Women often do not get employed because of the limitations and costs associated with their parental roles. It also is expensive to abide by the rules associated with the use of pesticides - pictured is one of the workers showing an aircraft that sprays hazardous chemicals even though there are people on the plantation. And so the people from plantations work more and more, for the same money, that continually loses value in their country. Their future could look different. Production could be more sustainable, prices and wages fairer. But we would have to get used to higher prices in the shops. Bananas are often promoted and sold at low cost. Yet someone always pays the price. Supermarkets know that consumers mostly remember the price for a kilogram of bananas and so they sell them very cheaply. The low prices attract customers eager for goods in sales. Bananas, yet shipped halfway around the world, are on average about a quarter cheaper than apples, a local European fruit! Banana split! What is the share of total value of a banana? Drag each part of the banana supply chain towards the numbers – guess which part of the retail price falls on each actor. We'll tell you the truth afterwards! I'm ready! Am I right? Few percents extra for the workers and the life on the plantations would be much easier. In Panama, we saw long queues for food given out to the people by the local government, since they cannot afford the prices in shops. It was basic food, bags of rice and beans. Getting fresh, healthy and nutritious food is a problem for a large part of the population of Panama and Costa Rica. And what surprised us the most? Onions and carrots are being brought here from the Netherlands, the same way they are being brought to us in Europe. Vegetable – traveler. "When you are poor, you must eat what you can afford." 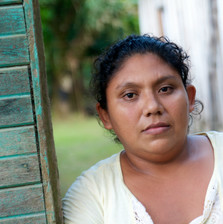 "I have four children, three in Nicaragua and one here. The oldest daughter is fourteen, then I have an eleven years old boy and another daughter, eight years old. Here I have the smallest one, he is one year old and he was born here. The situation in Nicaragua is different, there is no work ... we came here to seek employment and a better life, so to say. And they attack us for being from Nicaragua, they ask us why are we here and they want to hurt us. "When I pay rent, I have no money for food." 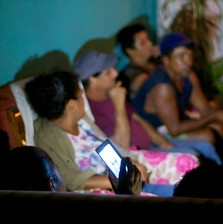 We talked with workers of the company, that supplies Fyffes with bananas, in the backyard of their very modest house. When we peeked inside, there was not a lot to see, it was nearly empty. Locals do not have that many things. The local dogs did not like us and they were barking so loudly that we almost could not understand each other. And probably not even monkeys resting high in the branches of trees liked us. Maybe you can recognize their typical growl on the recording. "If you want them to pay you for work you have done, they fire you." Who has the most power in the banana industry? In many countries today, the majority of the food market is dominated by the retail chains. They have very strong and powerful position. In fact, the supermarkets act as "gatekeepers", keeping watch over our shopping trolleys. They decide which supplier will get the opportunity to deliver its goods to the customers. Such an important role can be exploited and the retailers don't take a back seat. They often force their suppliers into very disadvantageous business conditions, transferring the business risks onto them and forcing them to sell at extremely low prices. The pressure to lower the prices is transmitted through the supply chain right back to its very beginning. Small growers and employees, the weakest players with little bargaining power, suffer the most. The banana business used to be dominated solely by a handful of fruit companies. In recent years, however, more important players get their space - the supermarkets. They source directly from the producing countries more and more often. In Britain, supermarkets sell 80% of bananas we eat. As grocery market share becomes concentrated in the hands of fewer retailers, suppliers have little option but to accept even unfair conditions. The stories from plantations can be different. There are places, where the banana business works differently from what you saw in previous chapters. Certification systems, independent unions and local authorities are the main characters in the more positive side of the banana story. 1. One of the most respected guarantees of ethical origin of the products is Fairtrade certification. Certified goods are marked with an easily recognizable blue-green label. 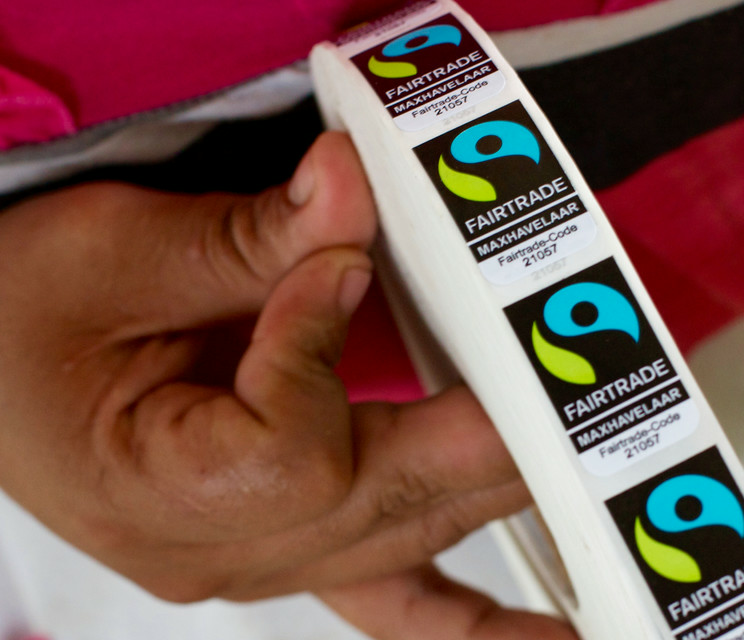 The strong suit of Fairtrade is a fixed minimum purchase price of the products and the payment of a social premium. Bananas are the flagship of Fairtrade certification. They are one of the most successful products next to the coffee and cocoa. Both the plantations and the co-operatives are certified. A large percentage of fair trade bananas are also organic certified. Be aware that the two are not the same! Fairtrade standards are less extensive about nature conservation than the organic standards. Pursuit of the lowest possible chemical consumption is a part of the Fairtrade rules: for instance, the farmers sow small plants on the plantation, that compete with weed and improve soil fertility. Thanks to these helpers the need for herbicides is much lower. The most dangerous kinds of pesticides are prohibited in Fairtrade. A ban on child and forced labor, democratic governance and equality are among the basic principles of Fairtrade. Protecting the rights of minorities and giving more space to women, so that they can assert their skills, is also an important feature of Fairtrade. In the photo, Colette Corenald, an accountant from the Fairtrade co-operative Coobana, smiles at you. Growers co-operatives and plantations receive $1 extra for each box of bananas. It is a social premium,which they can invest in production or development of their community. It depends on how they settle things, since the members decide democratically about the use of the premium. 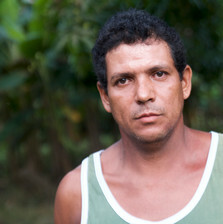 Meet one of the founders of the Coobana co-operative, Santiago Castillo Morales. For instance, the Panamanian Coobana co-operative, thanks to the social premium, has provided water tanks for local people, since the water from the well was foul. In a village, where, until recently, everyone had to use shared latrine, each family received money for their own bathroom and toilet. Dona Carmen had it completely decorated with lace! The co-operative also supports its members in construction or repair of their houses and gives land to the people from the city, so that they can build their own housing. 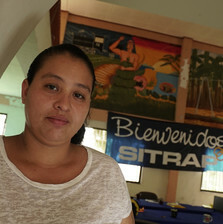 In the video: Luciana Palacio, Coobana, Panama. 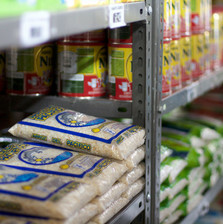 Coobana also had two shops built from the premium, in which they sell basic food at lower prices than other local shops. 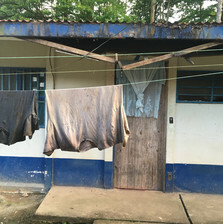 In Panama, the food is actually very expensive compared to people’s salaries and many families can’t afford to buy sufficiently nutritious food. Behind the counter of the co-operative store you can meet Adalia Baker Smith. Traditionally, a part of the premium goes to support education. Coobana gives scholarships to all who have good grades and want to study. In other cooperatives, they build a school or pay a teacher, depending on what the community needs. 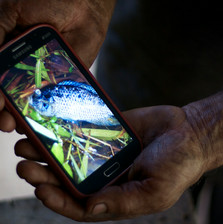 In the video: Júlia Santos, Coobana, Panama. Health protection is essential, and so the workers from a certified plantation are easily recognizable by rubber gloves, aprons and other protective clothing. They are also guaranteed at least the minimum wage, according to the law, or an average wage from the same industry in the same region - depending on which amount is higher. Beside Fairtrade certification an older, traditional Fair Trade system exists, in which the companies trading 100% Fair Trade goods are involved. Adherence to the Fair Trade principles is guaranteed by the membership in the World Fair Trade Organization. In the photo, an accountant from the traditional Ecuadorian collective UROCAL hands out the money to the farmers. There are so many certification systems that the consumers are often quite confused. Frequently, a label containing a green frog can be found on bananas, quacking for the Rainforest Alliance. The RA standards are, however, sometimes unclear or hard to verify. They don't include guaranteed minimum prices or a social premium either. Independent unions are very important to make working conditions on the plantations better too. Workers in producer countries often have little idea of their rights. In the photo a trade unionist is showing the difference between their paid salary and the amount the workers are supposed to get according to the law. Even the local authorities can play an important role, if they a genuinely care for protecting the rights of farmers and workers. 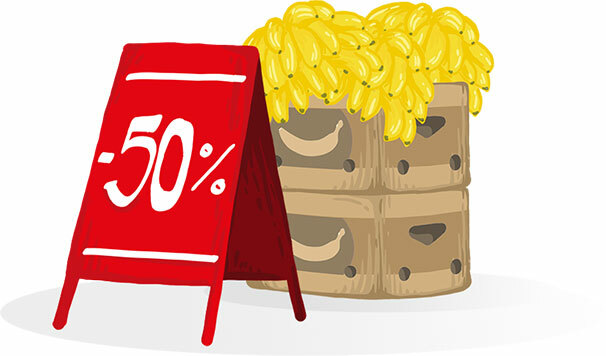 In Ecuador, for example, the government have introduced a minimum price for a box of bananas and enforces the rule by inspections and high fines. In Panama, visits from the Ministry of Labour are not unusual, they monitor the usage of protective gear by the employees. The vast majority of bananas from Peru are certified as being organic. Peruvians are able to grow organically because of the geographical conditions they have. The production area is surrounded by mountains, so growers do not have to worry so much about pests and diseases. Ecuador is the largest banana exporter in the world. The local government has set the official minimum price for a box of bananas to protect farmers against the fluctuations of the market and pressure from buyers, and also seeks to ensure that the minimum legal wage is a decent one. The country is among the five largest exporters in the world. Labor unions are traditionally very strong, with many members. But to be a labor unionist in Colombia also means to be in a constant threat of violence and murder. In Guatemala bananas are grown in the region of Izabal on the Caribbean coast and on the opposite side of the country, on the Pacific coast. The Pacific side is very problematic because the unions do not work there due to the violence, threats, kidnappings and murders of trade unionists. The unionists on the Caribbean side are also facing violence, but on the other hand, they were able to negotiate good working conditions with their employers. 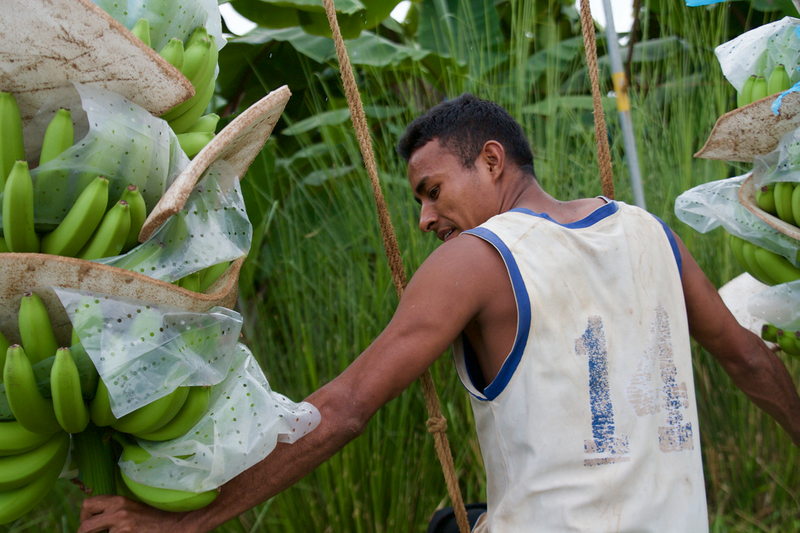 Bananas are the second most important export crop for Dominicans, and much of the produce is organic. Two-thirds of the employees are immigrants from neighboring Haiti and their living and working conditions are truly alarming. Some of them are in the country illegally, but a process of legalization started in 2015 and the necessary documents are being acquired gradually. The Philippines are the second largest exporter of bananas in the world, but they focus primarily on Asian markets. The export bananas account for about a quarter of the production, the rest is eaten by the Filipinos themselves. Banana exports from the African countries are growing steadily, yet the conditions on the plantations remain bad. Working hours are very long and the wages are miserable, as well as is the occupational health and safety protection. In 2015, however, an union of 4 labor organizations was formed i n the Ivory coast. Bananas constitute the fifth largest export earner for Cameroon, exporting to Europe, mainly to France and the UK. Workers on plantations in Cameroon suffer from poor wages that don't meet their basic living costs, while working long hours in hazardous conditions, with poor protection from illness and injury. However, there is a union called FAWU that helps them to protect their rights. UGANDA Uganda is now close behind India where most bananas in the world are grown. This fruit forms the basis of the local diet and Ugandans eat up to a kilo of bananas a day! But those are mainly salty plantains, which somewhat resemble our potatoes. Today, more that 85% of all the bananas grown on the Windward Islands are Fairtrade certified. Thanks to this certification, local growers in the Windward Island Farmers Association (WINFA) were able to overcome challenging times following devastating natural disasters in the recent years – including hurricanes associated with climate change. The autonomous Portuguese island territories of Madeira and the Azores supply their parent mainland country with great bananas. And the Portuguese give priority to their fruits, even though they are usually more expensive than bananas from Latin America. The British are the greatest banana eaters in Europe, consuming almost 18 kg every year! But there is also a high consumption in the Scandinavia. Banana prices in the UK are unfortunately extremely low due to the price wars between supermarkets. The country where you find the most varieties of banana in the world these days is India, with over 670 domesticated and wild varieties! Since 1920, the most important suppliers of bananas to France were the islands of Guadeloupe and Martinique, both overseas departments of France. Even today, their bananas account for over 30% of French consumption. According to European Commission data from 2014, the Estonian retail market is the most concentratedin all of Europe. The five largest retail groups control 76% of the food market there. Romania and Bulgaria , by contrast, have the least concentrated markets. The duty on banana imports to the EU was the reason for a protracted dispute between the US and the EU, often called "banana wars", which were . put to an end by the World Trade Organization and a subsequent Geneva Convention of 2010. According to which the import tariffs will gradually be reduced to the level of € 114 / tonne in 2019. The Canaries supply bananas especially to the Spanish mainland,. The Spanish consume 55% of the bananas produced in the EU countries, mainly from the Canaries". In 1888, the first shipment of Cavendish variety bananas sailed away from here to England, where it was bought by Thomas Fyffe. Lidl, together with its sister company, Kaufland, are based here. Lidl has stores in 26 countries and with annual sales amounting to 79.3 billion euros it is the fourth largest retail group in the world and the first in Europe. Once boats ferrying only bananas were used for transport and they had to be filled to the maximum. Today refrigerated containers are used that give the companies greater flexibility on the market, since now they are able to load just as many fruits as they need to. Due to technical limitations, we use the classical Mercator world map which shows the countries closer to the poles as proportionally larger than the countries near the equator. As a result, Europe looks much larger than it actually is. It is better to view the map in the Gall-Peters depiction that retains the proportions between displayed territories. Go bananas for fairer bananas! Is there something I could do? For sure there is! Fruit companies and supermarkets will change their behavior only once they feel a strong signal from the consumers, who care about the story of the stuff in their basket. The power is yours, superhero! Freedom and fairness for Fyffes workers: sign the petition! The Make Fruit Fair! Campaign is calling on Fyffes – the number one importer of bananas to Europe, and among the largest global marketer for Supersweet pineapples and winter season melons – to respect the rights of workers in its global supply chains. You can support this campaign by sending an email to Fyffes here! The majority of plantation workers continue to live in poverty and their most basic rights fail to be respected within the workplace. Banana Link is therefore appealing for donations to allow them to continue to offer solidarity to unions to challenge the repression of the freedom to organize, educate workers about their rights, and empower their union representatives to collectively bargain for living wages and Decent Work for the men and women that grow the fruit sold on our supermarket shelves. You can support Banana Link's Union to Union programe here. We are online as everybody today! You can follow either international Make Fruit Fair! campaign sources, or the channels of Banana Link from the UK. Most fairly traded bananas, pineapples or other tropical fruits carry the Fairtrade Mark used by Fairtrade International (FI), but there are also a number of established Fair Trade organizations conforming to the rules of Fairtrade International, or even going further, that do not use the Fairtrade Mark on their products, but for example the WFTO guarantee label. 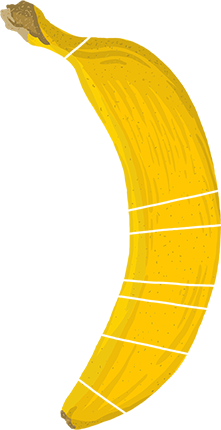 The site was created as a part of the international campaign Make Fruit Fair!, that fights for a more fair and sustainable way of trade in bananas and other fruits. In the UK, the campaign is led by Banana Link. We would love it if you would like to know more about us! 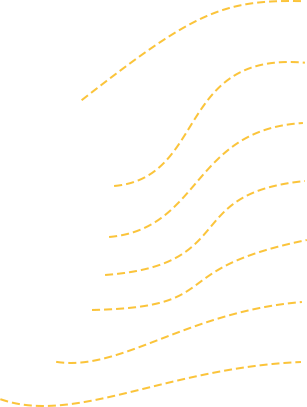 Contact us at info@bananalink.org.uk! The authors of the content are Jakub Freiwald, Stanislav Komínek, Pavla Kotíková and Barbora Trojak from the Czech Republic. Most of the photos and footage was taken in Costa Rica and Panama in July and August 2016. You can share our content for non-commercial purpose as long as you credit us (CC-BY-NC). Resources for all the information are listed here.